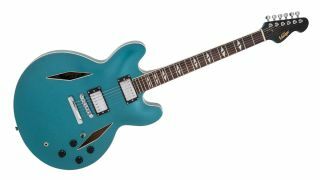 After a flurry of recent activity, Vintage has announced the VSA540 semi-acoustic, and there's no getting around it: the new model looks remarkably similar to Foo Fighters frontman Dave Grohl's venerable Trini Lopez ES-335. Aside from the familiar Gun Hill Blue finish and diamond soundholes, the VSA540 has an arched maple top, back and sides with mahogany neck and rosewood fingerboard, as well as a pair of Wilkinson Alnico V humbuckers for vintage-voiced tones. Elsewhere, the guitar features Wilkinson tuners and a tune-o-matic bridge and stopbar tailpiece, as well as a Graph Tech NuBone nut. The VSA540 will be available from early July for £369. Check out JHS for more info.